You think that guy that keeps downing them has a PHD. I know Saban was in town this week. Good to rub that ish off by a trip to Knoxville. He saw someone say that somewhere? said Tennessee is one of four schools recruiting him the hardest. No surprise as the freakish OLB is the No. 1 prospect in the Volunteer State. Grimes is a very thoughtful and smart kid, too. He talked about seeing the progress Tennessee made since he last visited. Alabama, where his dad played, is the natural frontrunner here, but Tennessee and Clemson will be in it until the very end. Grimes has the blessing to go wherever he feels most comfortable. He doesn't plan on making a decision until the UnderArmour Game next Jan.
Tennessee, naturally, has made the outside linebacker a top priority in the 2020 class, selling Grimes on being the centerpiece of the turnaround on Rocky Top. Jeremy Pruitt has a long relationship with Reggie Grimes Sr., a former Alabama defensive lineman, and now he’s working to convince Grimes’ son to play for the Vols. Grimes, who was back in town Saturday, is the No. 1 player in the Volunteer State, per Rivals. The 6-foot-3, 225-pound athlete plays linebacker, end and running back for the Golden Bears and clocked a 4.58 in cold and rainy conditions at The Opening Regionals last spring. Tennessee is giving Grimes the option of playing wherever he's most comfortable, with Pruitt and defensive coordinator Kevin Sherrer leading that recruitment. Their message has been the same since they came to town: Stay home and represent your state. "I hear that a lot,” Grimes said. NEED to do this to bama's face. Let's go. But even if that's hogwash, Pruitt is contending for elite prospects, so I wouldn't count us out on anyone this far out. Pretty sure Baron and Grimes are real good friends. Makes it that much more important to get Baron in the boat early to lead this class and stay in this guys ear till he is a VOL. This recruitment feels much more open than I would have expected. The allure of early playing time has to be huge. 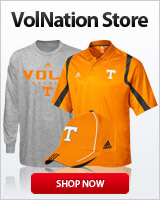 Another good thing is every coach or staff member @ MJHS will be in his ear about the Vols. I’d love to match this kid up with Tee Hodge from Maryville. Dl is a priority. I think he could be this cycles version of Darnell wright. As a RB, he reminds me of Little Man Stewart. And his Dad love Pruitt. I really hope Pruitt can seal the deal with Grimes.